Kindness is on the brain. I have not only been the recipient of great kindness as of late, but also, I seem to be witnessing it all around me. The kindness spectrum is a broad one to be sure. Small little gestures such as a smile which can brighten someone’s day, Q offering E her little pink musical basket as she scoots close to the bookcase where it resides (instead of throwing it as he is so inclined to do with everything these days), my dad who is leaving tomorrow packaging up something for me unasked so I didn’t have to worry about it, and the IRS folks who spent nearly 2 hours with me on the phone today as we tried to sort out why I received a giant bill in the mail, when I should not have to pay anything. Then there is virtual kindness. Emails from friends and loved ones. Sharing of blog posts by other bloggers on Facebook. Rallying behind causes and pages when it’s clear that the admins might need a little extra love and sweet comments left on posts of other bloggers to let them know you appreciate them, their experiences and their writing. All different small acts of kindness all with a different emotional reactions and outcomes. There are also bigger acts of kindness such as what we have received in the support of our March of Dimes team,”The Pruitt Wondertwins.” This kindness has moved me through a whole spectrum of emotions as well. The continued awe I have as our friends and family continue to rally around us when I feel odd and badly to ask them to keep giving us more of themselves. The fragility I have as I continue to take short trips back in time as we rally around this very special cause. And, the overwhelming sense of love I have for every kind word, donation, and extra extension of yourselves. It’s truly remarkable to experience this kindness. 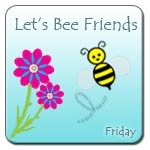 Linking up at “Bees with Honey” with some other amazing bloggers who give kindness all the time. So very true, what you say about kindness above. Interesting concept, that kindness comes before wisdom (or is the first step to wisdom). xo. “Big or small gestures, kindness does not need to be measured for really kindness is really about the way it makes us and others feel.” So true! Lately I’ve been overwhelmed, in a good way, by the level of kindness that exists in my life, largely from my growing interactions with some wonderful bloggers. I’m also equally disheartened with the lack of kindness that occurs in every day life around me. I’m amazed and somewhat horrified by what I see and hear. You are one of the people I appreciate so much, for your attitude, your kindness, your writing, your willingness to spread goodness into this world. So glad you are experiencing kindness Carrie. Not only are you so deserving as you spread kindness yourself but also you are a lovely light in this crazy world and you inspire kindness. It is sad that there does seem to be so much negativity in the world and that’s where it we can we can do our own small part. Basically, that’s what I try to do, some kindness here and there which helps brighten the world around me, like you do:). Thank you for reminding me about all the kind things that can happen in this world! I needed some perspective. It’s amazing how something as simple as a smile, hug or someone letting you into their lane while driving can add to the positiveness of your day. I totally agree. It’s the simple things that can often bring you great warmth because they are so unexpected. Thanks so much Kasey! Your words warm my heart and I couldn’t agree more, even I get caught up in the nonsense and the toxic cycle of frustration and forgetting to see the little things. I do the same as you in trying to find those reminders from this wonderful community of people as well as looking through the lens of my own blog where I take a little extra time to to find “that” moment in the day where I could say this moment makes it ‘mynewfavoriteday.’ I so appreciate interactions with people and comments here because it too let’s me know that others want to find and appreciate there little things too. Have a great day! A few years back, I made it a practice to do one kind, selfless thing for someone every day. The other part of it was that I couldn’t tell anyone what I had done. I learned some amazing things about myself as well as others through this practice. I just might have to do it again. I love this experiment. What a great way to spend each day looking or capitalizing on that one opportunity. I have done some version of this but not every day. So lovely and thank you for sharing it here! I may have to give it a try too! You really find beauty and joy in life. Coming here fills my soul. What a lovely comment Stasha! Thank you:) I certainly do try but kindness like this comment makes it easier to try and find to the good in each day. Thank you! The “law of attraction” states that we attract that which we put out to the universe. The kindness you have received and witnessed is clear proof the law of attraction is true. Lovely post, as always.